Mini-Sono: less punch than pack? Ultrasonic devices barely larger than an iPhone – at first it seems wonderful: Fatty liver degeneration? Gallstones? Blocked kidney and enlarged heart? The "Pocket-Sono" gives the answers. But is it really more than just a smart toy for techies? The easy-to-use device offers extended opportunities to examine locally for a faster diagnosis. It helps to detect diseases earlier, which, in view of the hectic hospital average workday, is of inestimable value, “especially for first responders, specialists in cardiology, intensive care and emergency medicine, gynecology, and for clinicians,” it says, for instance, in a 2010 company press release from the firm GE Healthcare on the introduction of its “Vscan“. At about 7000 Euro, the less-than-400 gram “Pocket-Sono” is in the same price class as the Acuson system (P10 ™) – compared to the conventional units it is therefore undoubtedly a bargain. At first glance, the handheld devices seem to be really useful. 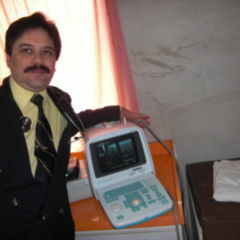 They do not replace conventional ultrasound systems, but permit a first evaluation. The professors Christian Prinz and Jens-Uwe Voigt of the University of Leuven have recently tested such a mobile device (the unit from GE) for its usefulness in cardiological diagnosis. The results are quite positive, as are some comments from other cardiologists. The picture isn’t of course all rosy. For their study, Prince and Voigt compared the mobile device with a standard echocardiography system. Their results were recently published in the Journal of the American Society of Echocardiography”. 349 patients for whom an echocardiogram had been scheduled were examined. All patients were examined with the mobile handheld device and with a conventional ultrasound system by a doctor experienced in echocardiography. The Pocket-Sono came out by no means badly, endocardium and regional myocardial wall motion were as well as left ventricular ejection fraction reliably assessed. Just as with the conventional system, all six patients with an abnormal accumulation of fluid in the pericardial space were identified. In addition, there was a high degree of agreement between the two systems in the assessment of the heart valves, the return-flow of blood measured by the Pocket-Sono was concluded to be a slight overestimation in the severity of dysfunction. With stenoses, however, the outcome was not as convincing: The severity of aortic stenosis was underestimated in half of the patients. Relevant clinical findings were (however) not totally overlooked, write Prince and Voigt. But the assessment of stenosis was not reliable enough, as the required spectral Doppler performance was (still) missing. U.S. cardiologist Dr. Kirk T. Spencer of the University of Chicago, who for several years dealt with the subject (Journal of the American College of Cardiology) considers, however, the statement that no relevant findings had been overlooked to be a little too positive, given the limited technical possibilities. These devices are useful for some specific medical queries, but with these you simply cannot exclude everything, he tells Heart Wire, the portal of U.S. cardiologists companies. The queries on the pericardial fluid and heart size could indeed be answered reliably. But these are not usually the questions for which an answer is sought by doing an echocardiography. Patients would generally come with non-specific problems, such as dizziness, for which there are several potential causes. Using the pocket devices, they could not all be excluded. Spencer sees somewhat critically also the result of a second current study and the conclusions of the authors. In this study, Portuguese cardiologists working under Dr. Nuno Cardim (Hospital da Luz in Lisbon) with 189 outpatients checked to learn whether, after a conventional clinical examination with ultrasound, a sonography using the pocket device delivered useful additional information. The investigations were made by cardiologists with experience in echocardiography who had a week to familiarise themselves with the small devices. According to Cardim, the clinical and sonographic examinations in 35 percent of the cases corresponded to the determined outcome that a referral to an ultrasound laboratory was not necessary. In about two out of ten cases there was consensus to refer the patient. 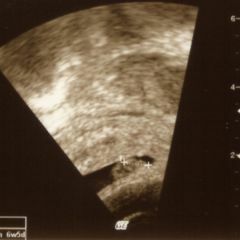 In 14 percent an identification for transfer was made by sonography, while the clinical examination spoke against it. In almost a third of instances it was the other way around. There was a need for further ultrasound diagnosis only when a spectral Doppler function was required. Poor image quality was never, according to Cardim, the reason. Using the small sonography device, left ventricular dilatation and systolic dysfunction were repeatedly found which resulted in drug therapy, the observations of which during the clinical examination were often not made. The diagnosis of wall motion abnormalities in combination with chest pain also had therapeutic consequences, as well as did the sonographic detection of an enlarged left atrium in patients with paroxysmal palpitations. Cardim believes that the smart device therefore offers additional information, increases the number of diagnoses, reduces the number of unnecessary and increase the number of useful echocardiographs. Spencer maintains, however, it is absurd to try to identify with the aid of a pocket device those patients who could forego a conventional echocardiogram. If a patient seeks help because of potential cardiac problems from a cardiologist, then a complete echocardiogram would be necessary. This is also how his colleague Dr. James N. Kirkpatrick, a cardiologist at the University of Pennsylvania in Philadelphia, sees it. If someone has cardiac symptoms and needs an echocardiogram, he should also get the best diagnosis which is available. More optimistic is Dr. William A. Zoghbi from the Methodist DeBakey Heart and Vascular Center in Houston. The devices could enhance the clinical investigation process, which does have its limits. He views somewhat critically its use on hospital patients with whom, in contrast to outpatients, the image quality may not be sufficiently good due to the severity of the disease. In addition, there is in the clinic a full ultrasound system normally available so that, in his view, the use of small units in particular could be useful in regions where no “high-end device” is available. In addition a screening of patients may be useful who might have risk factors, but are not at such risk that a conventional echocardiography is necessary. 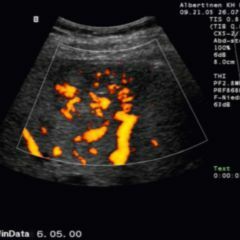 Further application options, according to Spencer, exist in emergency medicine or critical care units, since the doctors here need information quickly for further action, for example, and cannot or don’t wish to wait until the next morning for a conventional ultrasound. Kirkpatrick in turn sees a benefit of the small appliances (also) in the relatively continuous and easy control of relevant parameters, such as cardiac filling-pressure values. The problem for the use of such mobile devices is obviously not in its use (benefit). The hook is probably the price. It is comparatively small. These examinations also save time for doctors and patients. The health insurance companies however generally don’t take on the costs.